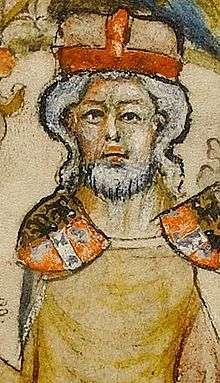 Berthold IV (c. 1159 – 12 August 1204), a member of the House of Andechs, was Margrave of Istria and Carniola (as Berthold II). About 1180/82 he already bore the title of a Duke of Merania, that is, the Adriatic seacoast of Dalmatia and Istria. Berthold was the son of Count Berthold III of Andechs and his wife Hedwig of Wittelsbach. His father had been a loyal liensman of Emperor Frederick Barbarossa and in turn was enfeoffed with the Istrian march upon the death of the Sponheim margrave Engelbert III. Young Berthold IV first appeared in 1170 and was mentioned as Count of Andechs in a 1172 deed. In 1175 he served as co-ruler in the March of Istria. After Emperor Frederick deposed Duke Henry the Lion in 1180, his mother's relative Otto of Wittelsbach received the Duchy of Bavaria, while Berthold was received the Duchy of Merania. The rule over "Merania" actually encompassed the same area as the old Istrian margraviate, but its ruler now gained much prestige from his new title and the comital House of Andechs was elevated to Princes of the Holy Roman Empire. In 1186, he accompanied Emperor Frederick's son Henry VI to Italy and his marriage with Constance of Sicily. In 1189, he led the third division of the imperial army and was its standard-bearer on the Third Crusade. In 1195, he appeared as Vogt (reeve) of Tegernsee Abbey in Bavaria. Berthold committed himself to join the Crusade of 1197, however, he did not participate until Henry's death in the same year. Though he had opposed the emperor's Erbreichsplan, he backed the claims of Henry's younger brother Philip of Swabia against the politics of Pope Innocent III who supported Philip's Welf rival Otto IV. At this juncture, the House of Andechs was at the height of its power and influence, with extended possessions stretching from Franconia down to the Adriatic. Berthold died in 1204 and was buried at the Andechs private monastery in Dießen, Bavaria. Matilda (Mechtild, d. 1254), wife of Engelbert III, Count of Gorizia. While passing through Serbia on the Third Crusade, Frederick Barbarossa met the Grand Prince Stefan Nemanja in Niš on 27 July 1189. There it was negotiated that a daughter of Berthold would marry Tohu, son of Prince Miroslav of Zahumlje on the fest of Saint George next (24 April 1190). This marriage does not seem to have taken place and the Historia de Expeditione Friderici Imperatoris does not name the daughter. Scholars are divided over whether it was one of Berthold's known daughters or else a fifth daughter not otherwise recorded. ↑ G. A. Loud, ed. (2010), The Crusade of Frederick Barbarossa: The History of the Expedition of the Emperor Frederick and Related Texts, Ashgate, pp. 61–62 ; Jonathan Lyon (2013), Princely Brothers and Sisters: The Sibling Bond in German Politics, 1100–1250, Ithaca and London: Cornell University Press, p. 154 n. 10 .